Discussion in 'Brakes, Wheels and Tires' started by VoodooBoss, Feb 29, 2016. This is for tips and any specialty tools needed to replace the front brake pads. The calipers are very large and heavy so having something other than a bungee cord to hold the caliper in place while you remove the pads and push back the pistons is going to be useful. 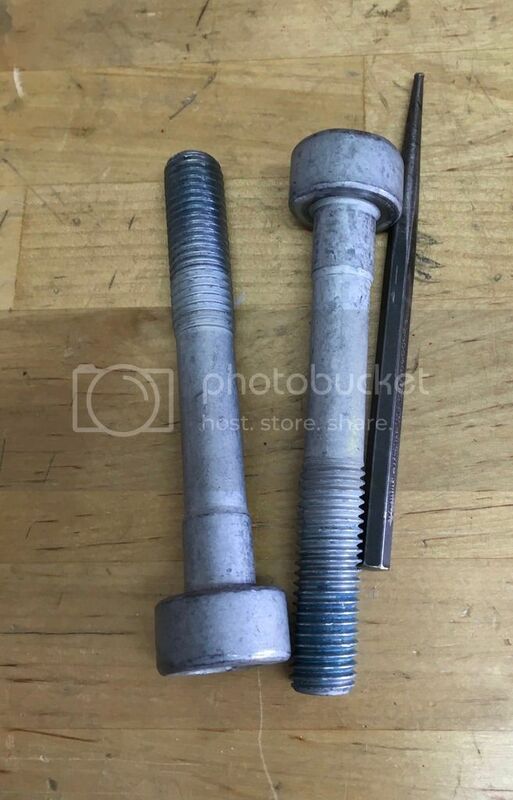 First thing is are you going to replace the bolts everytime you replace the pads? That's going to get expensive quick and probably unnecessary. On the Boss 302 and BBP GT's we were having issues with the threads getting messed up from removing and installing the steel bolts into the aluminum calipers. Cleaning the threads was relatively easy with a proper tap. If it got really bad it wasn't too expensive to replace a caliper. On the GT350 stripping out the aluminum in the front knuckle is another ball of wax altogether. Proper maintenance up front could save you some real hassles later. I'm also going to explore installing studs with nuts instead of the bolts. 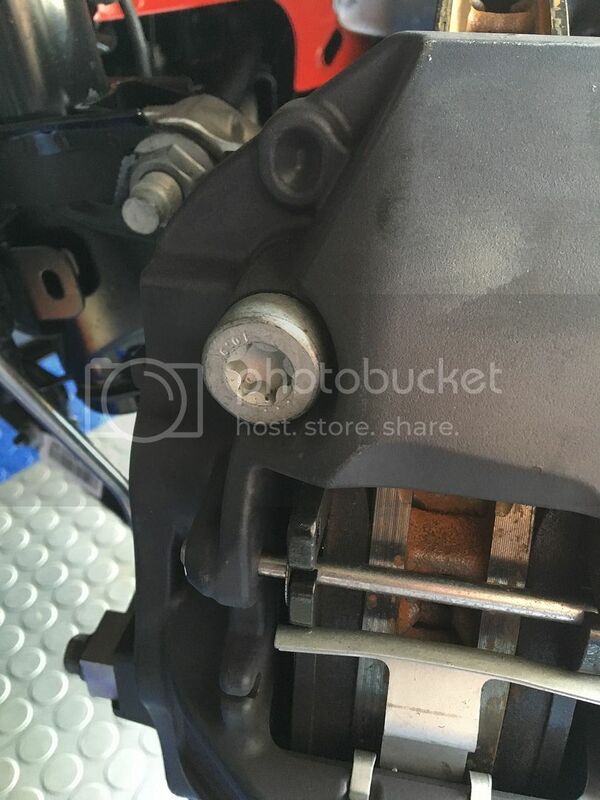 The bolts are slightly recessed inside the caliper and that might make it difficult to find a nut to fit properly. But if it can be done it will be a big improvement and shorten the time to swap pads. 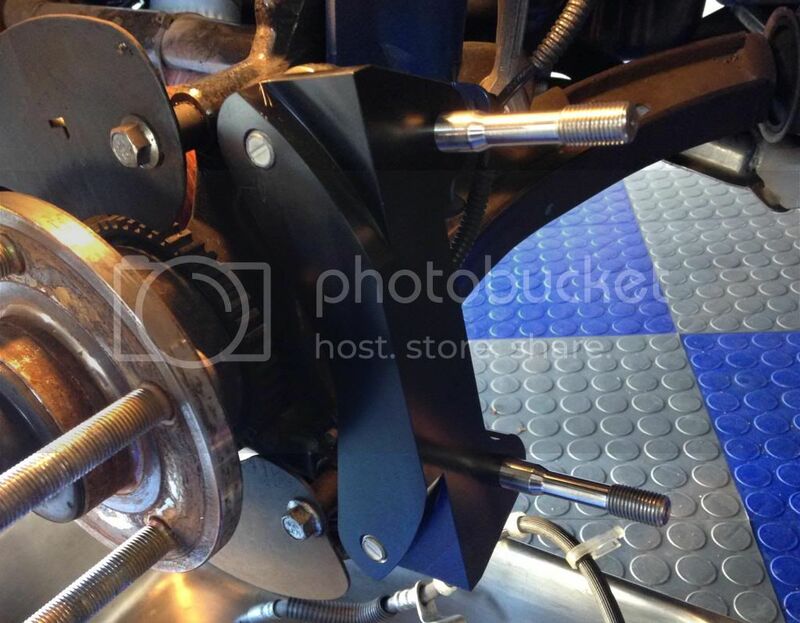 @Black Boss can you please post the link of the piston spreader you're using? The Full Tilt Boogie levers many of us used on the four piston Brembos isn't going to work after you have removed the calipers to pull the pads out. So a proper spreader will be necessary. A second set of hands won't hurt either. Anyway post up any tips you have. If anyone finds a good solution to suspend the front caliper while you pull the old pads, recess the pistons and then reinstall the pads please post up. One tip I can think of up front is to loosen the pad pins before removing the caliper. As the Brits would say Brilliant! That's a great idea. That spreader isn't cheap but it might save a lot of time and swearing. I see the part number on the bolts as: 91290A261 I'll order four in case I need to work on both at the same time. 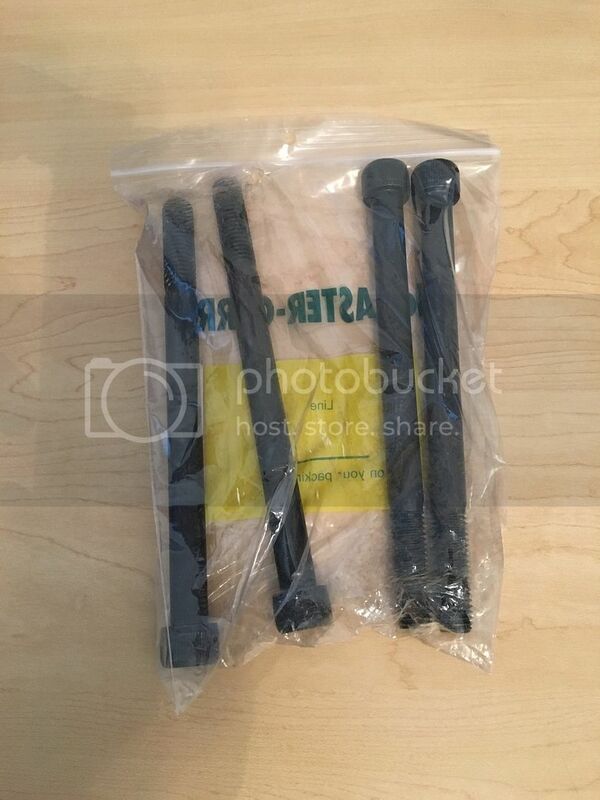 I ordered four as well and also the piston spreader Black Boss recommended a few months ago. I just haven't gotten around to changing the pads yet. I don't plan to replace the bolts every time I change pads, but do plan to remove the Loctite and use anti-seize. It's pretty heavy duty compared to the Full Tilt Boogie lever we were using. How was you guys spreading the calipers on your Bosses without the spreader? I use the old pads as a lever against the rotor to push the pistons in. Not the most efficient way, but it works. I use a Lisle 29100 Quick Quad Pad Spreader. It works well, is not as expensive at the Girodisc took, and will fit in a tool bag I take to the track. I would rather have the Girodisc tool for the garage, but it is expensive. Is that a OEM Ford parts online shop? What is the URL link to it? They're great for engineering buys, commercial parts and small quantities. They will not supply material certification and get very expensive in volume. They also cannot fulfill any military requirements. But overall, they fill their niche market admirably. I have been looking at this thing and I can't picture how it works? Remove the pads, insert with the steel rod against the rotor and the short end touching both pistons and lever them in until they're flush with the inside edge of the caliper. Rick, while its still fresh in your mind, can you review much of the swap? I'd like to follow your lead and take advantage of what you learned in doing both front and rears on this car. TIA. Remember I'm no master mechanic but I'll walk through the whole process on how I would do it, and the way I originally planned to do it, not how I did it by doing the fronts first and then going back and doing the rears. I'd replace the rears first, passenger side first and driver side second. Then move to the fronts and change the passenger side then the driver side. 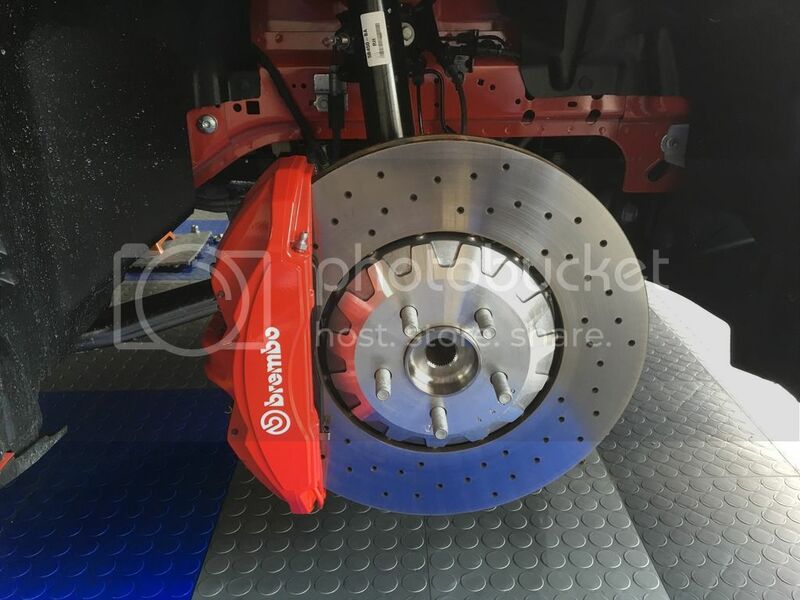 I'd bled each caliper as I go and just get the fluid through to each caliper then go back and bleed the brakes after you have installed all four calipers. It's not a good idea to run the reservoir dry so be careful to add DOT 4 fluid as you go. @8250RPM 's tip to loosen the parking brake cable up under the car was the trick that worked for me. I was unable to get the parking brake cable loose not doing so. Mark the adjuster so you don't have to guess how tight you should get it once you have the rears done. The caliper bolts are a PITA to get at due to the parking brake bracket covering them. Patience is your friend. I'm now thinking of buying an air wrench which should make removing and installing the bolts much easier. I have a compressor just not the wrench... I knocked loose the pad positioning pins on both the front and rear calipers before removing the caliper bolts. Just get them loose but don't remove them. You'll need eight of the brass washers for the banjo bolts front and rear. Those suckers are way over priced and expensive so order them online in advance. Might as well order four extras to have in your toolbox. I paid $9 each at my local dealer and won't do that again! I reused all caliper and banjo bolts and cleaned them with a wire brush and then shot the banjo bolts with brake cleaner before reinstalling. I did apply blue loctite on the rear caliper bolts before reinstalling and torques to specs, 81 ft lbs. If you are just replacing the pads the process will be the same as the four piston Brembos on the S197 cars. As I already mentioned you'll need a T-60 Torx bit. I did not have one in my tool box and the largest I had was a T-50. Craftsman sells a four bit kit that includes a T-55 and T-60 or hit your local Harbor Freight. Removal and installation of the fronts is very easy and straight forward. Remember the calipers are large and heavy so have everything laid out and ready to go so you can quickly remove and reinstall. Purchase four of the longer bolts to help with changing pads and they might help with replacing the calipers too. I cleaned off the loctite and used anti-seize on the bolts and torqued to 116 ft lbs. I also used witness marks on the bolts. You need to decide if this is the way to go for you if you and the official TMO recommendation is to follow the service manual on this. Obviously you'll need a large pan to catch the brake fluid that will go everywhere. I have an old full size "hotel pan" from my restaurant career and it works beautifully. 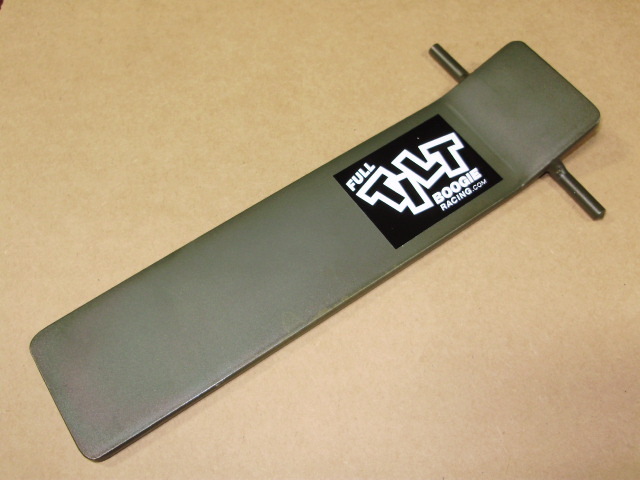 For the front pad replacement you'll want to first knock the pad pins loose but not remove them. Then remove one caliper bolt and install the longer bolt. Next do the same with the other caliper bolt. 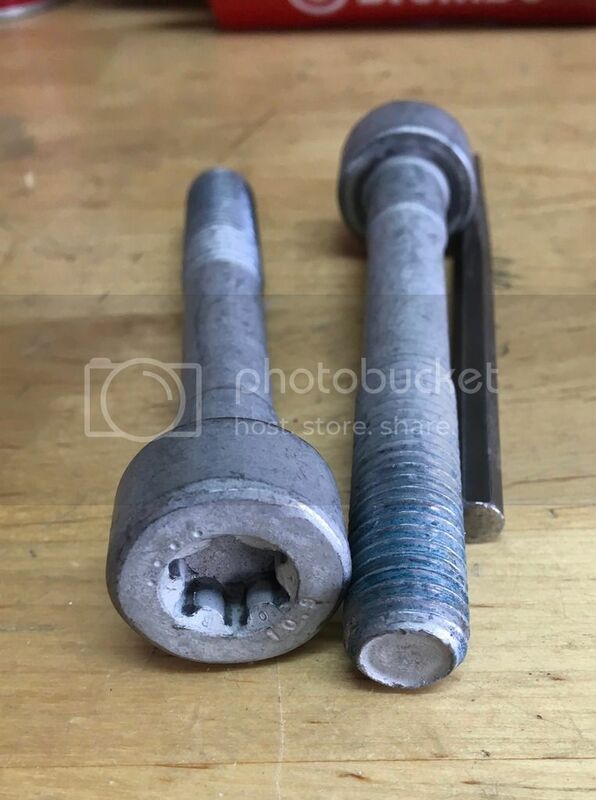 The install bolts use a 12mm allen bit which I also didn't have in my toolbox. Then slide the caliper back and push the pins completely out. 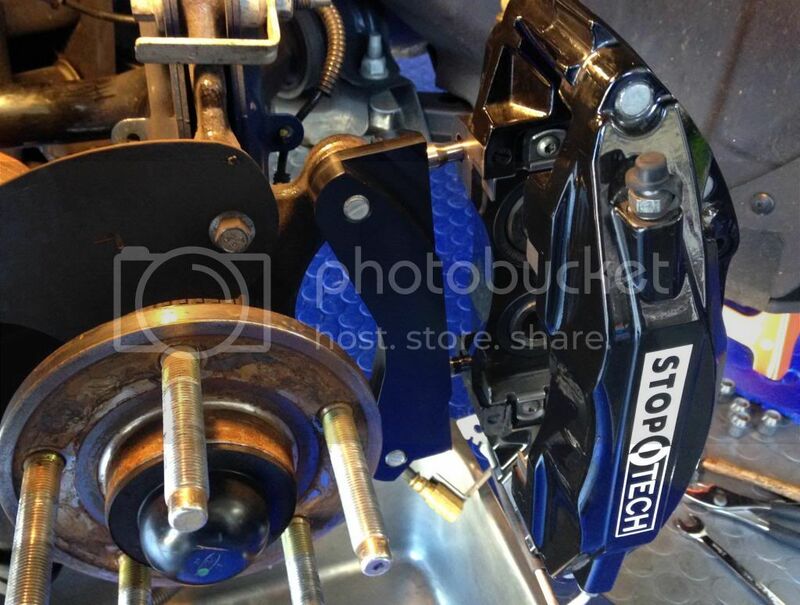 Remove the pads and use a piston spreader to push the pistons back into the caliper. Install the new pads and pins and reverse the process. I was really worried the front pad replacement was going to be a complete PITA but using the longer bolts will make the process easy. Again an air wrench should make the installation process go much faster. Just make sure the bolts are started by hand because you don't want to strip out the threads in the aluminum knuckle. 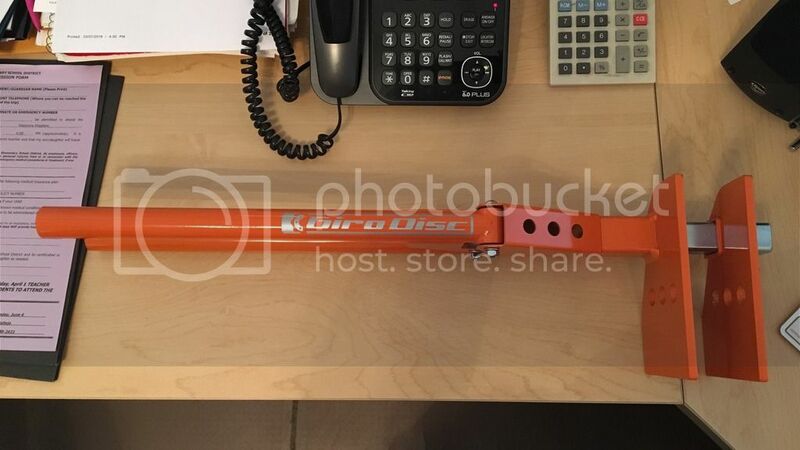 Torque settings and wrench sized can be found at the link below. Yikes this thing is huge! Fortunately I'm not opposed to a little overkill now and then. ;D I'll be testing this next weekend when I install my Pagid test pads. I know I couldn't believe it when it arrived. I'm worried about the extra space and weight on the trailer!